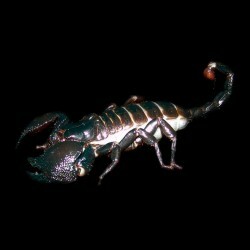 Scorpions For Sale - The Serpentarium, Inc. Dune Scorpions (Smeringurus mesaensis) - Commonly referred to as the Dune scorpion, Arizona Dune Scorpion, and California Dune Scorpion. Emperor Scorpion (Pandinus imperator) - The Emperor's size, relatively low toxicity, and life span make it the most popular pet scorpion. The Giant Desert Hairy Scorpion (Hadrurus arizonensis), Giant Hairy Scorpion, or Arizona Desert Hairy Scorpion, is the largest scorpion in North America, and one of the 8-9 species of Hadrurus in the United States, attaining a length of 5.5 in (14 cm). Rusty Thick Tail Scorpions (Babycurus jacksoni) - This species can be kept communally as adults, however, they are very cannibalistic when young.